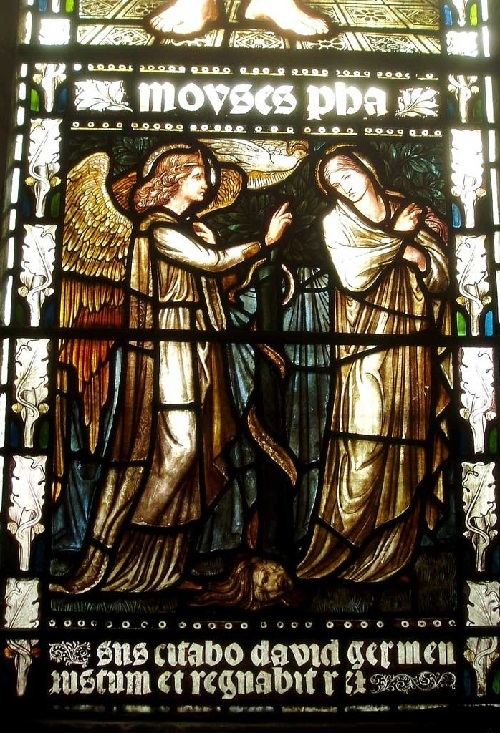 Stained glass windows by Edward Burne-Jones (1833 – 1898) – congenial Pre-Raphaelite English painter and designer, one of the most prominent representatives of the “Arts and Crafts Movement.” Sir Edward Coley Burne-Jones was born in the English city of Birmingham. 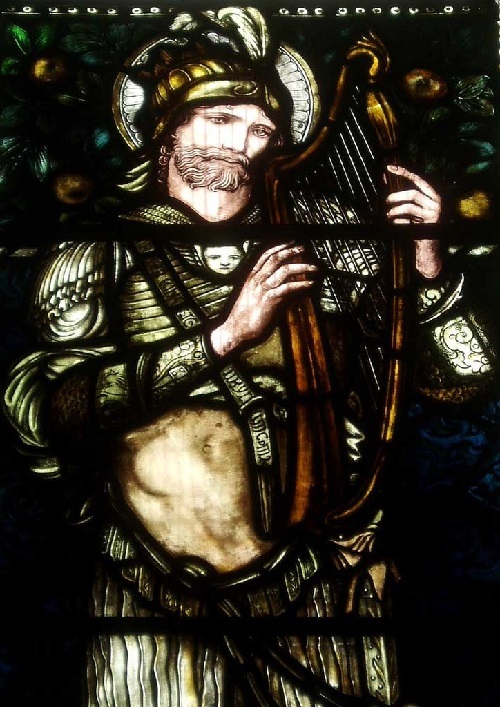 Sir Edward Burne-Jones was a unique person widely known throughout the world for his beautiful stained glass windows, which were performed with the closest friend of his life William Morris. 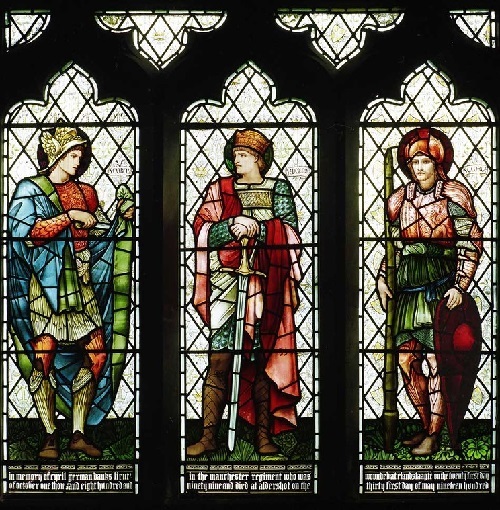 They met in Oxford, while studying and then walked through life together. 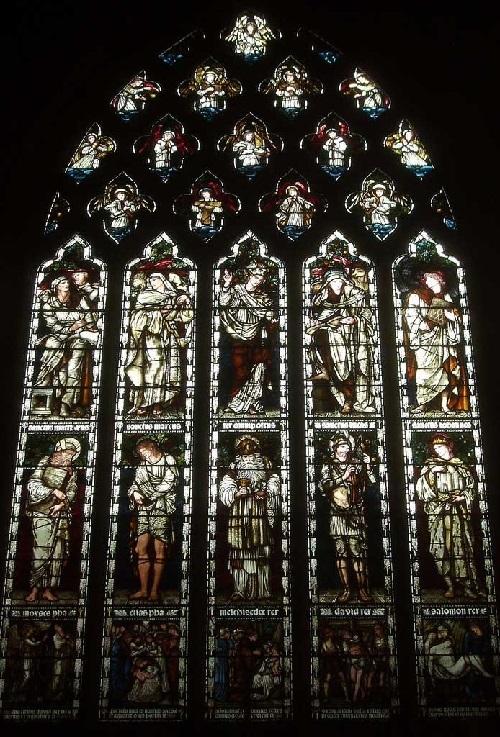 Stained glass windows, made ​​by his sketches and cartoons in the “Morris & Co”, can be seen in churches throughout England. 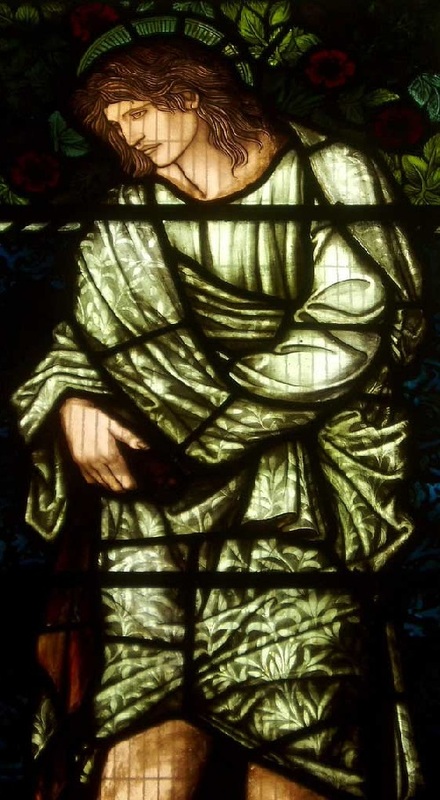 In 1856 Burne-Jones became engaged to Georgiana MacDonald (1840-1920). In 1860 the couple were married. 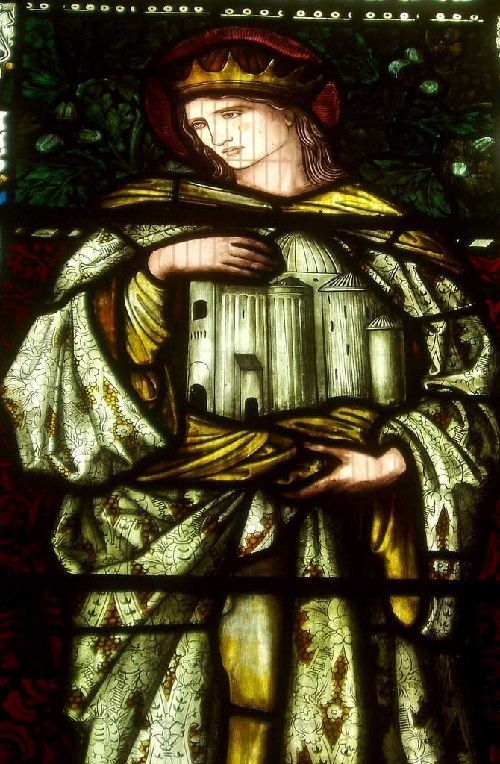 Interestingly, the second sister of Georgiana married the owner of the metallurgical enterprises Alfred Baldwin and was the mother of Stanley Baldwin (1867-1947), 1st Earl Baldwin of Bewgley – British politician, a member of the Conservative Party UK, British Prime Minister in 1923-1924, 1924-1929 and 1935-1937, respectively. It was he who insisted on the abdication of Edward VIII in 1936, but after the coronation of George VI in May 1937 resigned from the new king, and received the title Earl of Bewdley. 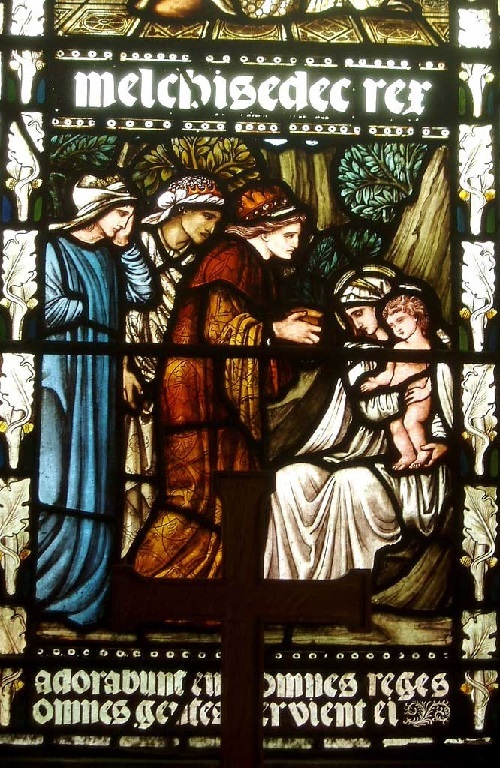 And the third sister of McDonald became the mother of Joseph Rudyard Kipling (1865-1936) – English writer and poet, author of “The Jungle Book”, “Kim”, as well as numerous poems. 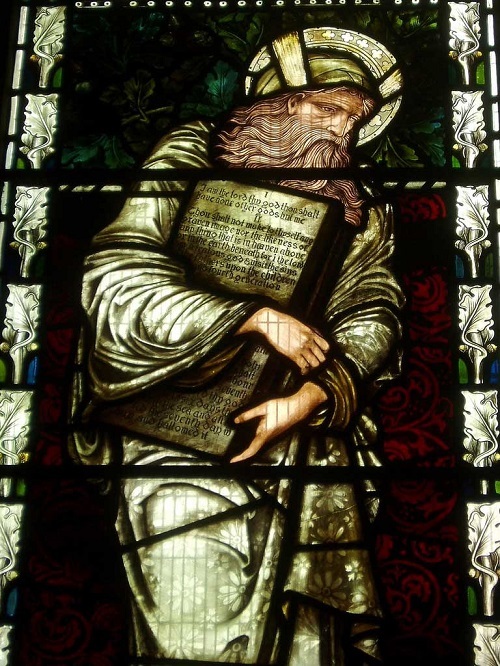 In 1907 Kipling became the first Englishman – Nobel Prize in literature. 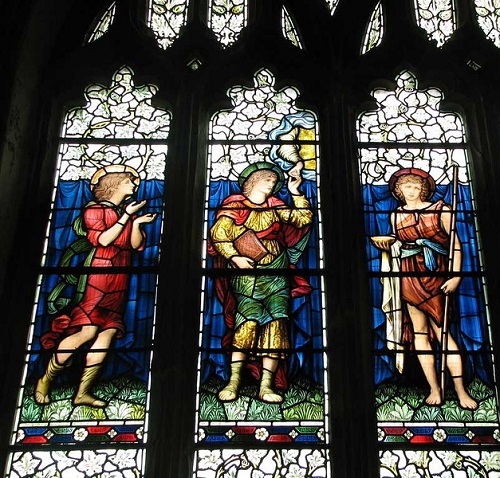 But back to the stained glass windows – a complex and laborious mind decorative art. It is a collective work that requires a strong material base and the efforts of many people. Therefore, the process should lead strong and energetic people who believe in the end result. 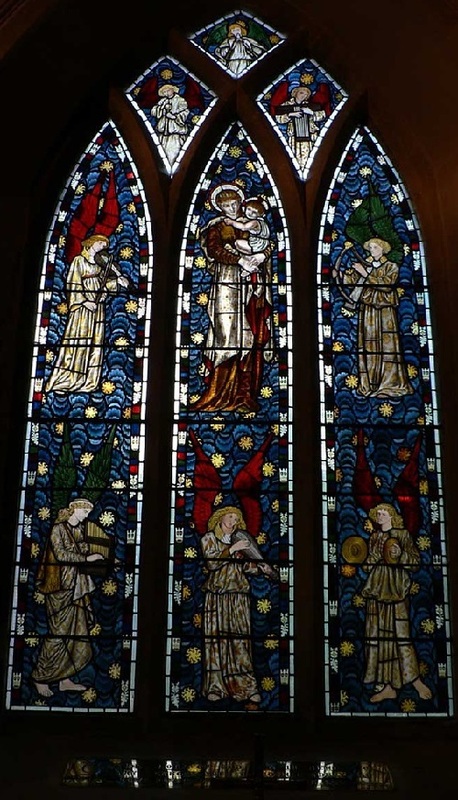 Stained glass in the church of St. Martin (St Martin in the Bullring) established by Sir Edward Burne-Jones in 1875. 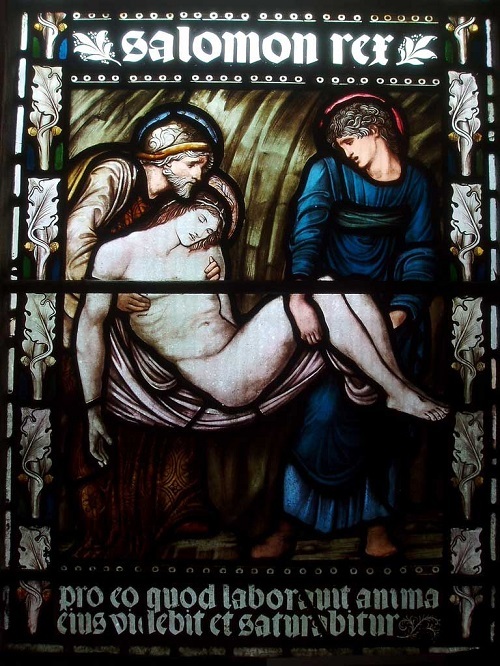 Production was carried out in the “Morris & Co”. 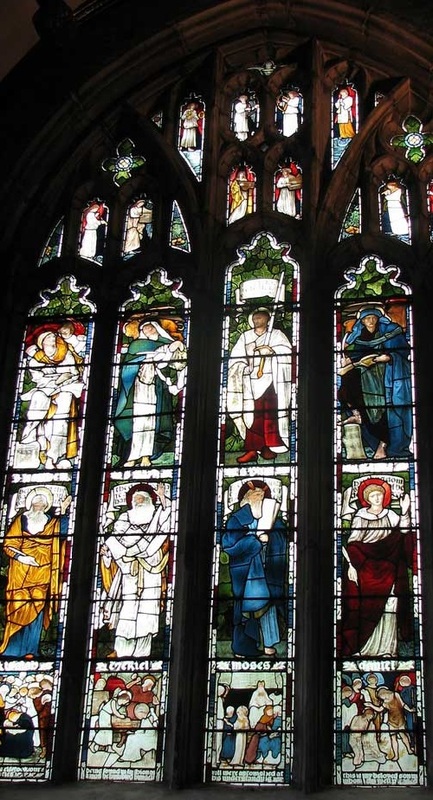 During the Great Patriotic War, the windows were removed and miraculously remained intact. 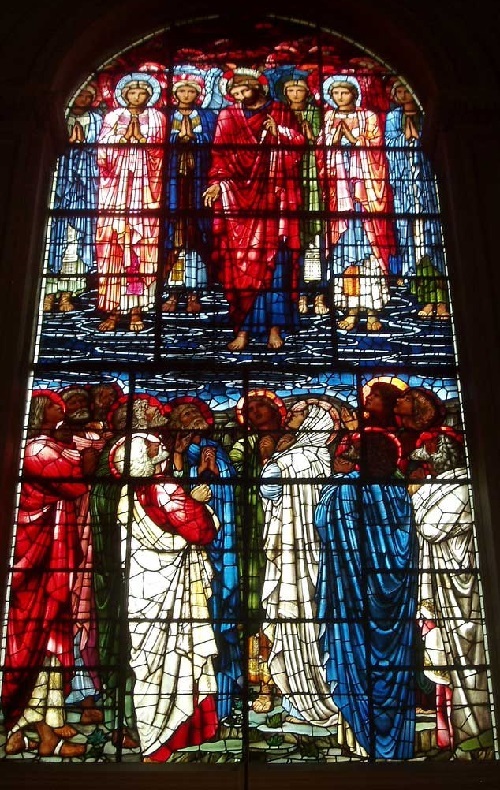 In 1941 the Council of the parish church of St. Martin Committee decided against the removal of stained glass, but a direct order from the bishop of Birmingham, Dr. CU Barnes (Dr WE Barnes) demanded their immediate removal. 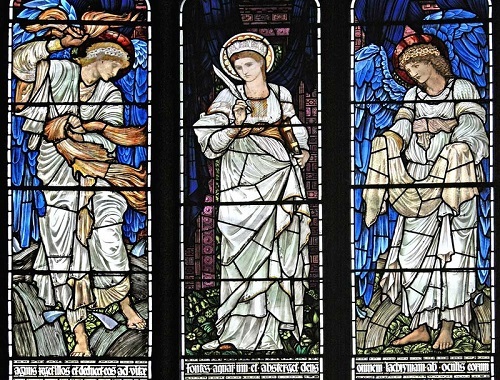 Low glass panels by Sir Edward Burne-Jones were removed – bombers arrived in the morning, leaving all the other windows and the church completely destroyed. 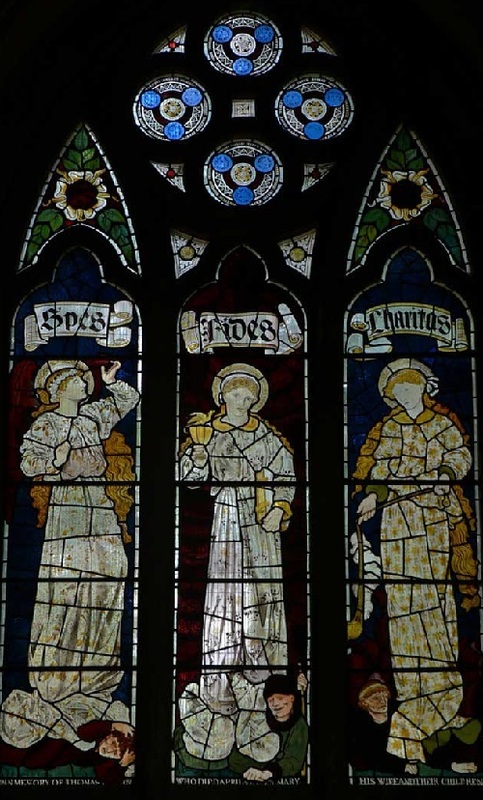 Low glass panels Sir Edward Burne-Jones were removed – bombers arrived in the morning, leaving all the other windows and the church completely destroyed. 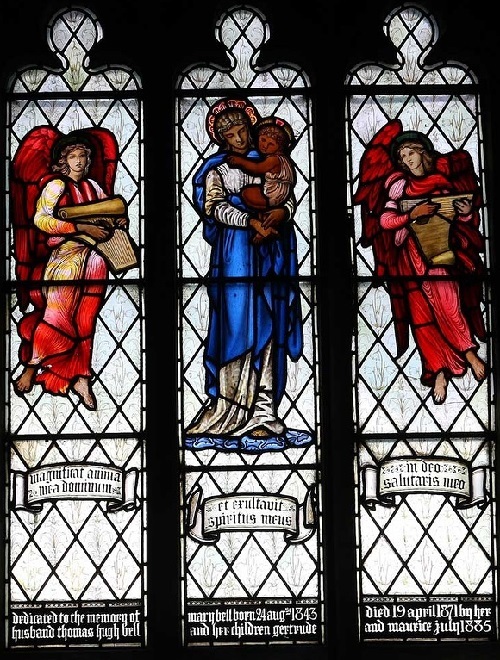 The Lord protects creations of their favorite artists. 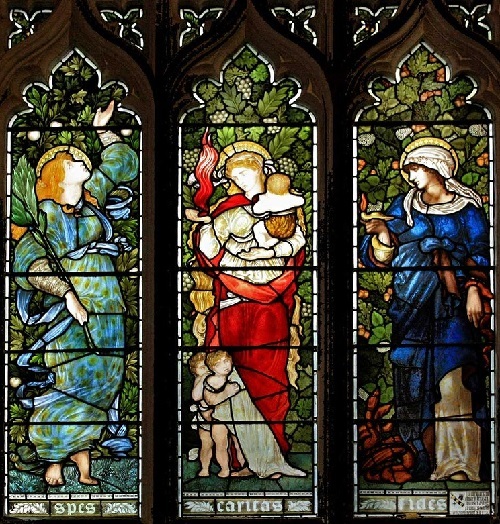 These stained glass windows are a very unusual example of the work of Burne-Jones and Morris. The color range has a tranquil brownish-green, muted tone, has rich shades. 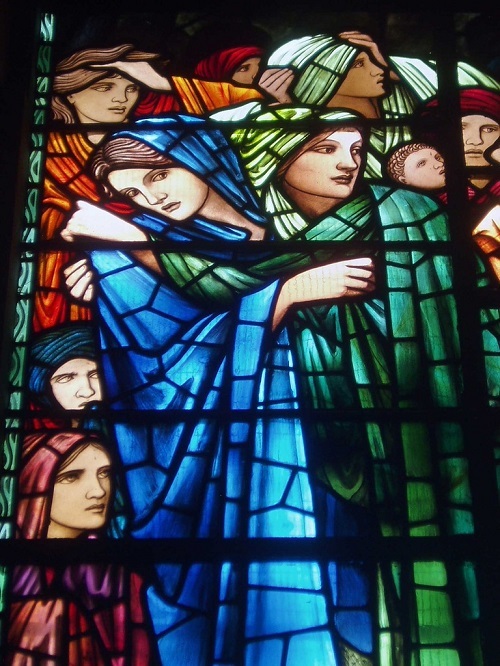 Sir Edward Burne-Jones was not a great artist in the truest sense of the word. He never reached the absolute mastery of artists such as Rembrandt and Velazquez, but also among the great artists he takes his place, no doubt, in the first row. 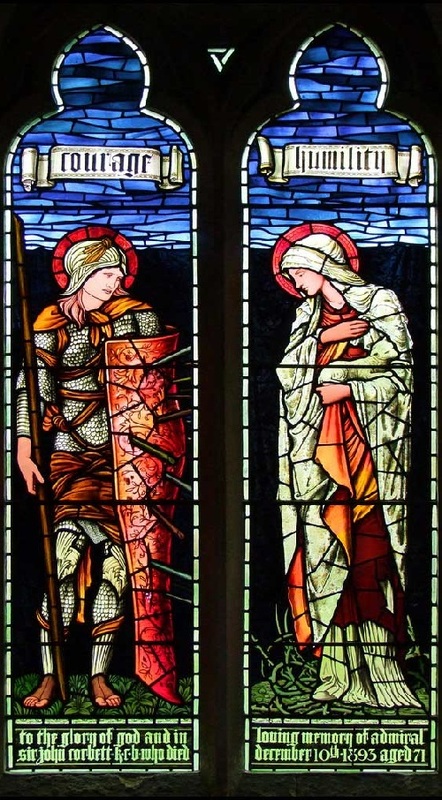 From the beginning of his work he had an unerring sense of beauty of form and color, powerful and overwhelming originality and unsurpassed elegance and subtlety fantasy. 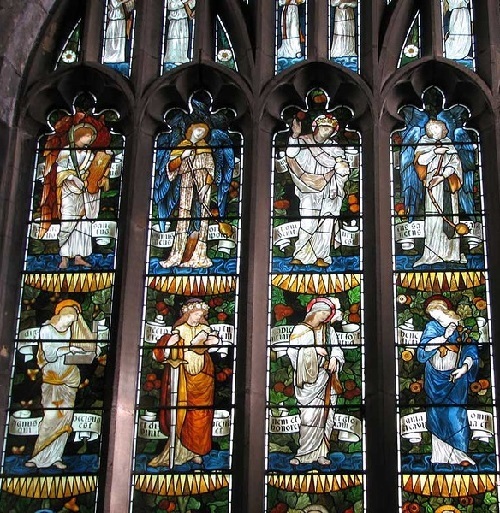 Stained glass windows in the Church of St. Philip (later became the cathedral) are considered the best works of Sir Edward Burne-Jones and it’s hard to disagree. This is a real treasure. 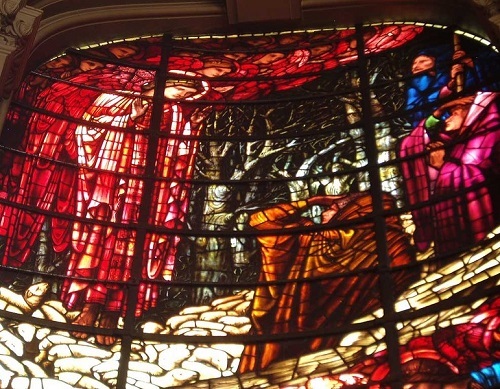 The interior is dominated by four superb stained glass made ​​in the “Morris & Co” since 1880. 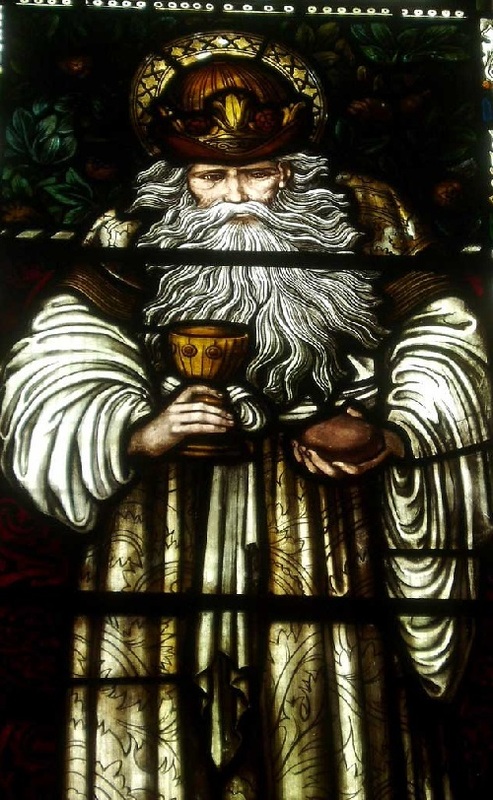 This north-east window in the cathedral of Birmingham (Birmingham Cathedral). 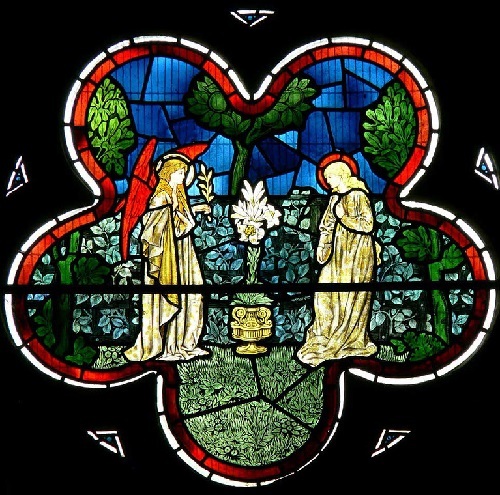 Stained glass window depicting the Nativity presented in a striking diagonal composition includes Holy Family with Angels in the cave. 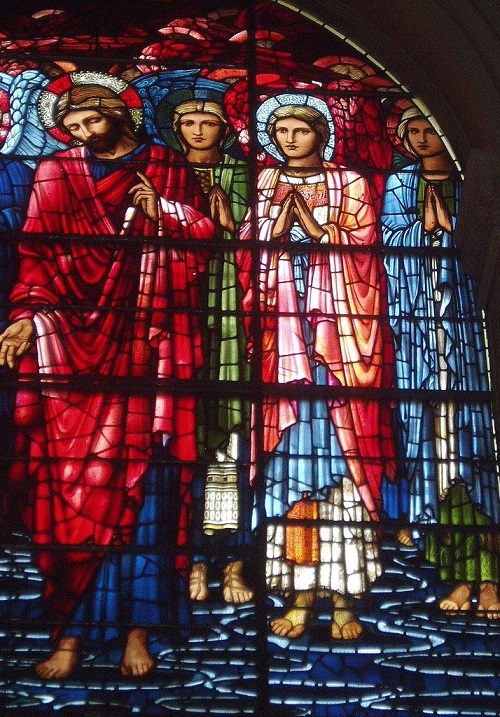 The top of the stained-glass window depicts another group of dazzlingly beautiful angels who appeal to the shepherds. Bright and rich color, a complex game of red and blue, purple and various shades of green, rich orange-brown palette. 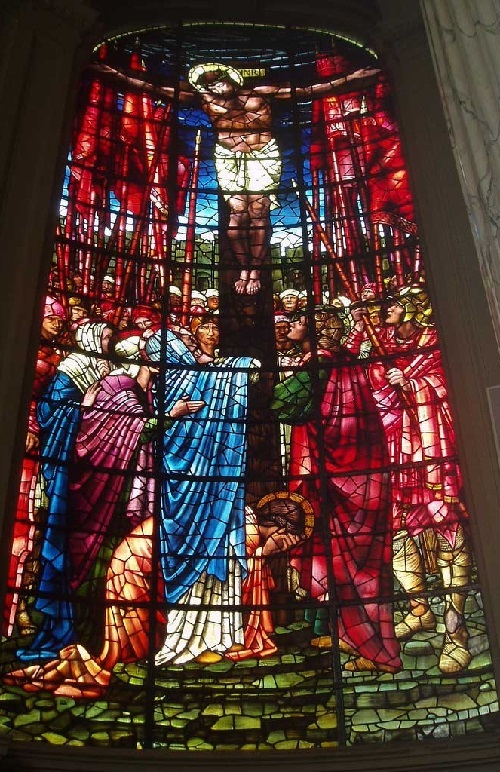 The artist loved this cathedral, because he was baptized in it. 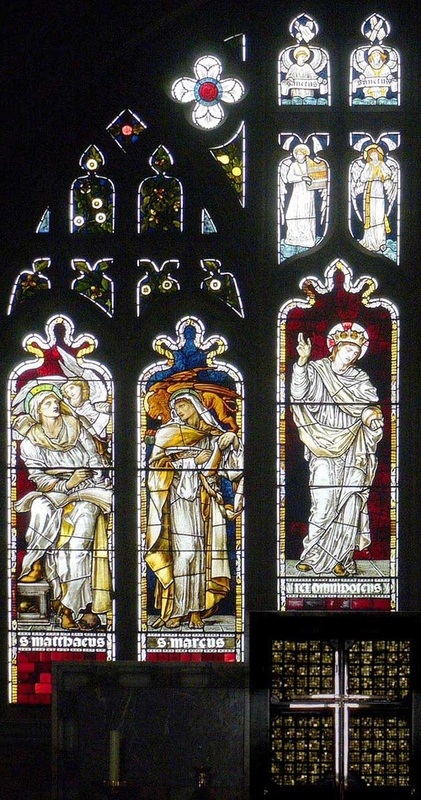 The stained glass has a complex composition solution. 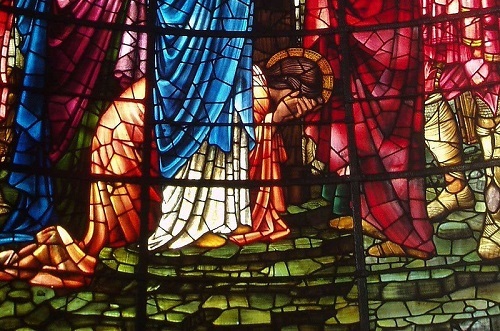 Witnessing the death of Christ on the cross is set for a crowd, the foreground shows all those who are close to Christ, left the myrrh-bearing in the center of his mother Mary in blue and Saint John in red, Mary Magdalene weeping at the foot of the cross. 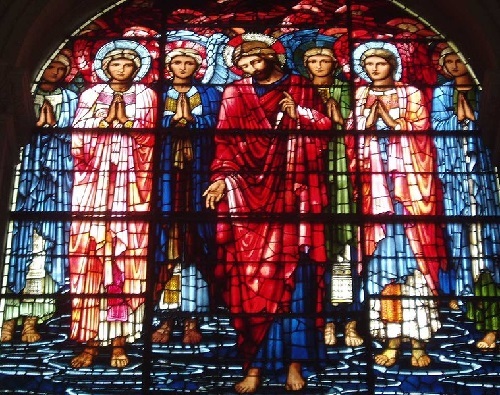 Background figures allotted in Middle Eastern robes of grey shades (those who chose Barabba, and betrayed the Savior). Color symbolism is striking. 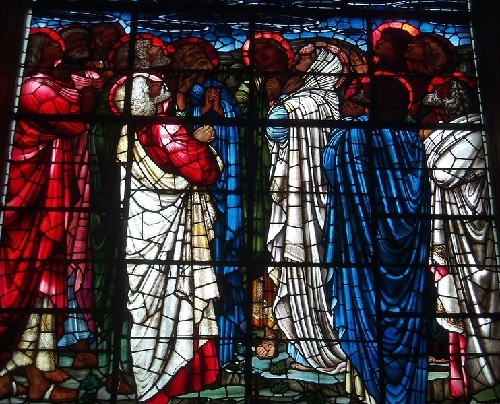 And yet it must be done in glass, where the process to manage the color – not a simple one. 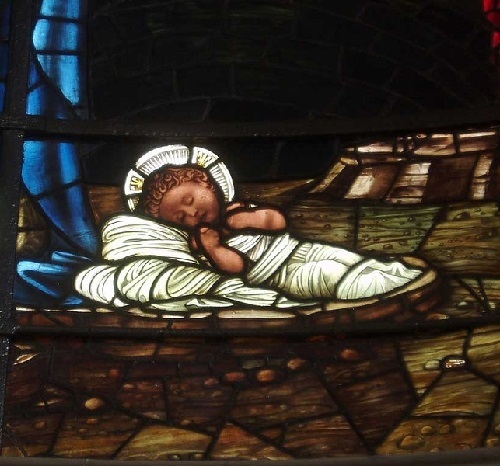 This is the west window in the cathedral of Birmingham. 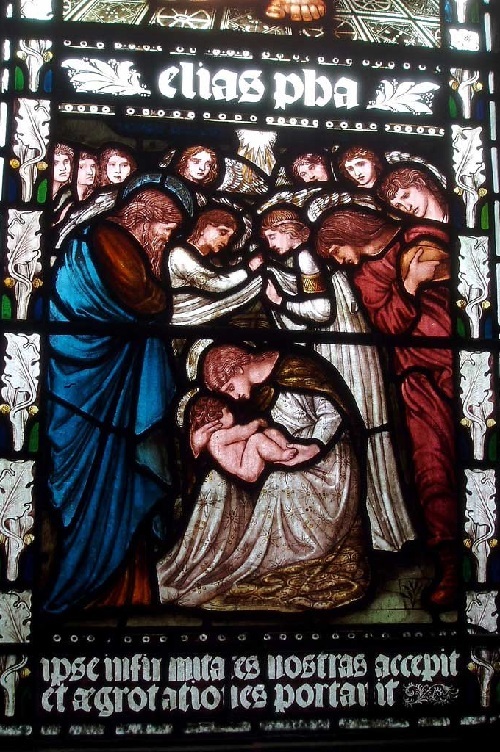 It is one of four superb stained glass by Sir Edward Burne-Jones created for the church in the “Morris & Co” in the 1880s. 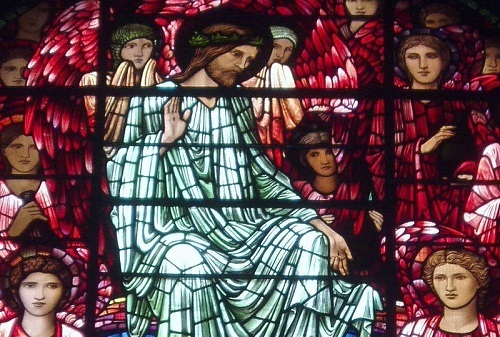 Christ is depicted sitting in court, surrounded by beautiful angels in rich red and pink robes. 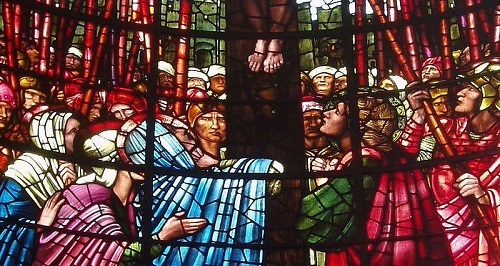 Below – a crowd of people waiting for their fate. 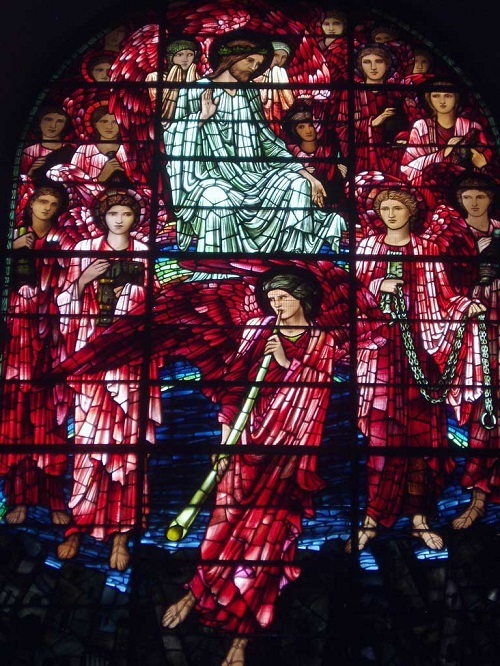 They are in confusion and fear at the sight of heavenly punishment, descending to him from heaven. 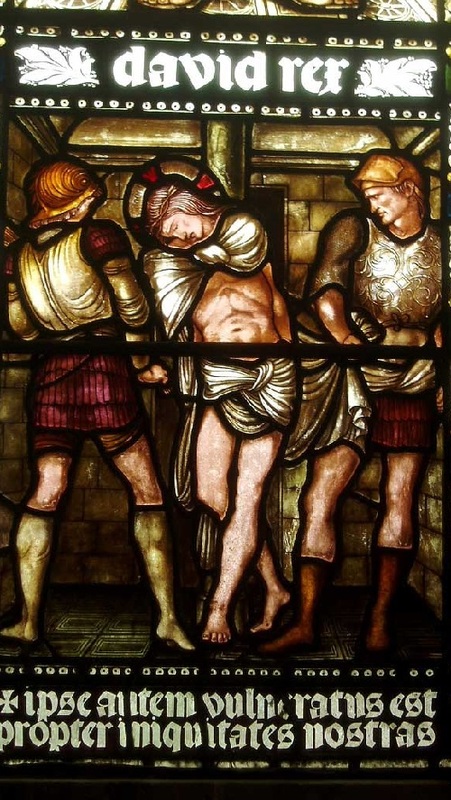 This is perhaps the most dramatic of all the Victorian stained glass windows and a great testimony of skill of the artist.